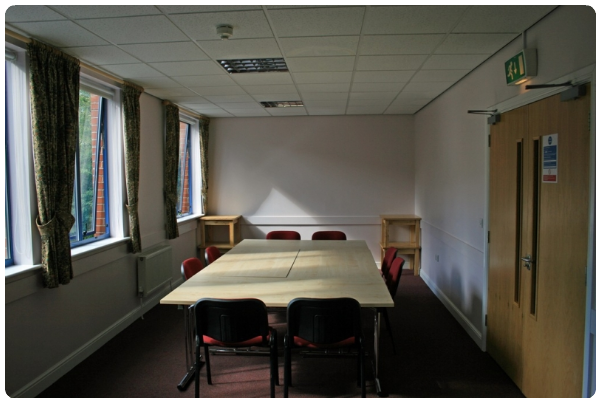 OUR SMALLEST ROOM THIS IS MORE SUITED TO COMMITTEE STYLE MEETINGS OF UP TO 12 PEOPLE. THE ROOM WILL HOLD UP TO 20 PEOPLE COMFORTABLY FOR A LECTURE STYLE PRESETATION. THE ROOM IS SITUATED AT THE REAR OF THE BUILDING OVERLOOKING THE CAR PARK. ACCESS FROM ADJACENT LIFT AND STAIRS.